Today’s adventure continued our trek up the 469-mile Blue Ridge Parkway. Thankfully, I had picked up a book at the Asheville visitor’s center – Guide to the Blue Ridge Parkway. This book not only gives a history of the Parkway, but mile-by-mile info on the best sights and stops. The descriptions of each of the overlooks, views and historic buildings also come with the origins of the names and any historic significance. Like the Route 66 Guide we used, this has been a little treasure that has greatly enhanced our trip on the Parkway. One of the more delightful stops was at the Blue Ridge Music Center. Often hosting summer concerts at their outdoor amphitheater in the summer, the center also has a nice museum that showcases the roots of American music. We stopped to have a nice break from the road; we didn’t expect that there would be any performances on a Monday afternoon. We were wrong. We were treated to the music of the Buck Mountain Band. Banjo, fiddle, guitar, stand-up bass and some traditional Bluegrass music…they got our toes tapping! Of course, the girls enjoyed the music too! We stayed for a little while and then decided to move on down the road. We’ve had nearly perfect weather since we started this trip. We had three rainy days since the start–two while we were staying in Kentucky and one on the road when we were motoring from Colorado to Kentucky. Of course, in the span of the five minutes that it took to get the car, the skies opened up. As we drove down the road, the rain caused poor visibility and fog banks steaming off the ground. This didn’t make sense to us…it was 65 degrees out! Where are we? Pea soup land! We were headed to the historic Mabry Mil, and I was concerned that we’d be rained out. 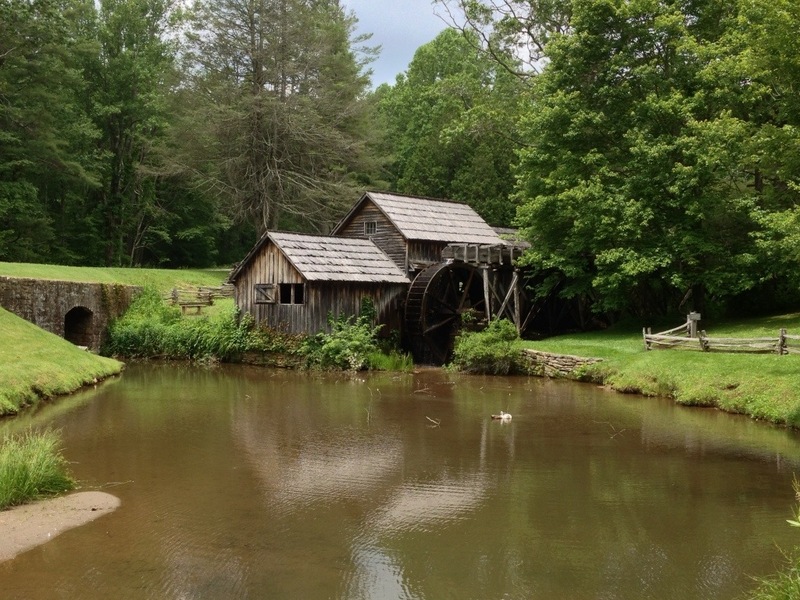 The mill is one of the most photographed areas on the Parkway…I didn’t want to miss my photo op! Well, I was not disappointed. 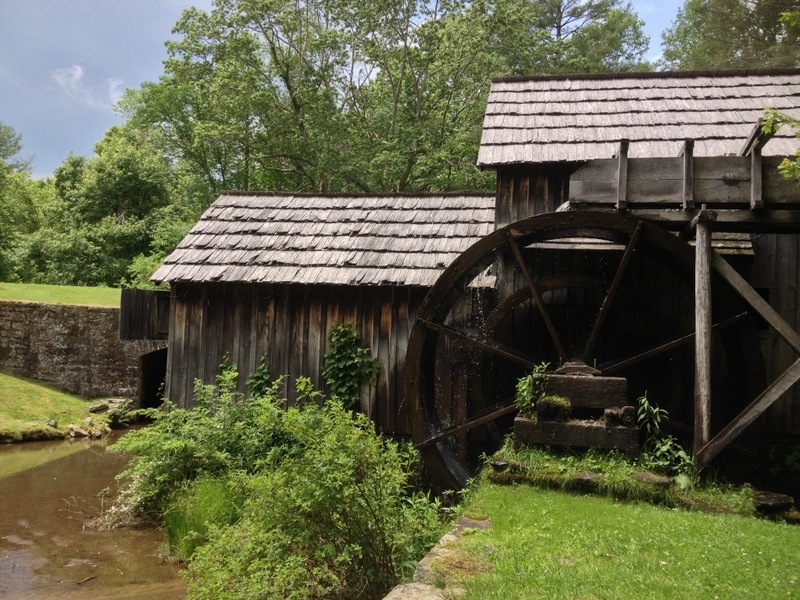 By the time we reached the Mabry Mill a few minutes later, the skies had cleared and the sun was peeking through. Stellar! The mill was beautiful. While it’s not a working mill anymore, there was a craftsman demonstrating the creation of handmade chairs (historically correct, using the same tools as those used during the mill’s operation). The grounds were very beautiful, and the air was clean and cool. There were more vistas along the way, but much of it was rained out for us. However, we did stop at Devil’s Backbone (mainly for the great name). Once again, the girls have been great. However, Juliet learned a new trick–jump from the back seat on TOP of the luggage in the back cargo area. Bad monkey! She’s getting bolder every day! Little angels? Not that cherub on the left! Tonight, we’re hunkered down at the La Quinta in Salem, VA (suburb of Roanoke)–a free night due to our frequent traveler points accumulated during this trip! Tomorrow, we’ll finish the Blue Ridge Parkway and traverse Skyline Drive in Shenandoah National Park (thanks John…we were planning this but your suggestion cemented our plans). We’ll then settle for the night in Winchester, VA and then head to Central PA to visit our friends Bob and Sharon for a night and regale them with our travel stories. We began this trip visiting Bob and Sharon and the Michels family. It’s so nice that we are able to start and end a great trip with good friends.